The Falcon File by Daniel Wyatt, is now available from good ebook stores everywhere, including Amazon (for Kindle), iBooks, Smashwords, Google Play Books, Kobo, and Barnes & Noble (for Nook Books). This is an omnibus edition containing the previously published books The Fuehrermaster, The Filberg Consortium and Foo Fighters. The intelligence war in Europe during the Second World War opens the eyes of young American intelligence officer Wesley Hollinger. He does not like what he sees. Spring, 1941. Britain’s Prime Minister Winston Churchill is on the verge of being overthrown by an English lobby group of Nazi appeasers who plan to sign a secret pact with Nazi Fuehrer Adolf Hitler to end the war in Europe. Hitler gets wind of the overthrow. He feels that the British group are ready to cut a deal on his terms, and that only one man–his deputy Rudolf Hess–could pull it off for the Fatherland. Through secret channels, Gestapo chief Heinrich Himmler–who has his own ambitions to be Fuehrer–finds out what Hess and Hitler are attempting. It is late 1941. America has yet to enter the war. A German agent secretly lands in Great Britain with orders from Gestapo chief Heinrich Himmler and financed by I.S. Filberg, the huge German industrial cartel, to identify and kill the prisoner called Rudolf Hess. Meanwhile, in London, American agent Wesley Hollinger discovers a crucial missing section to the first Hess peace papers found near the crash site in Scotland. The paperwork itemizes sensitive Wall Street loans to Nazi war factories — deals arranged by I.S. Filberg. It is early 1945 and Germany is losing the war. The Russians, the Americans, and the British are closing in on Berlin and Hitler’s bunker. In this startling end-of-the-war tale two high-ranking Nazi officials, Martin Bormann and Hermann Goering, are collaborating with Wesley Hollinger and the American OSS for free passage out of Germany in exchange for blueprints to advanced German technology — jet fighters, rockets, missiles and early flying saucers, nicknamed “Foo Fighters”. The Americans are desperate to keep the Foo Fighter blueprints from reaching Russian and British hands. Wesley Hollinger of the OSS soon realizes what World War Two is really all about — power, money, and politics. 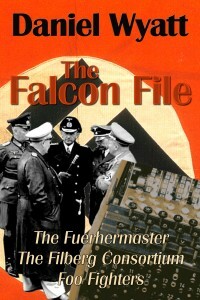 For more info, please see the The Falcon File page on mushroom-ebooks.com.